This was one of the all-time classic English GP events! Many fans made an annual pilgrimage to the Nottingham Royal Concert Hall for the English re-run of the Mr. Olympia, one week after the event in U.S.A. This year the fans were treated to a magnificent display of physique artistry, style and size from the one and only VINCE TAYLOR. 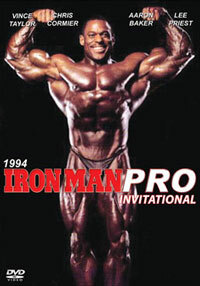 Vince "The Prince" stormed to victory over KEVIN LEVRONE adding yet another pro title to his huge collection of titles. This video showcases the whole event, namely the PREJUDGING of rounds 1 and 2 followed by the posing routines at the EVENING SHOW, plus the comparisons and posedown of the top 6 competitors. We have included ALL of the comparisons of rounds 1 and 2 to give you a superb, closeup comparison of these great physiques. The top 5 competitors, VINCE TAYLOR, KEVIN LEVRONE, CHARLES CLAIRMONTE, NASSER EL SONBATY and CHRIS CORMIER were all so close it was a judge's nightmare. 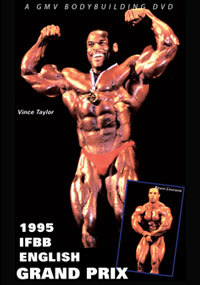 This was to be Vince's last victory at the English Grand Prix before winning 5 Masters Olympia titles. Vince is still competing today and will compete in the 2007 Mr Olympia in Las Vegas. This is one of the few DVDs we have that includes Paul DeMayo.